INGOLSTADT, Germany - Audi has incorporated the name and the genes of the five-time Le Mans winner, the Audi R8, into a spectacular sports car. Three years after the unveiling of the Audi Le Mans quattro concept car, the production version will be making its debut at the Paris Motor Show in the guise of the new Audi R8 mid-engined sports model. It is a fascinating driving machine and the sporty pinnacle of the Audi brand. The mid-mounted 420 hp V8 FSI engine, quattro permanent all-wheel drive and Audi Space Frame aluminum body form the basis for truly outstanding driving dynamics. As the first Audi mid-engined sports car, the R8 combines Audi's experience gained from numerous motorsport triumphs with groundbreaking design and the acknowledged technological expertise of the brand. This expertise has led to the slogan 'Vorsprung durch Technik' becoming a byword for leading-edge technology both on the race track and on the road. Audi has recorded countless motorsport victories on race tracks all over the world. Following the rally successes of the Ingolstadt brand in the 1980s, and its triumphs on the touring car circuit, the world of long-distance motor racing was without a doubt the biggest challenge yet faced by Audi's motorsport engineers. And they mastered this challenge in style to the Audi R8 won the prestigious Le Mans 24 Hours five times - from 2000 to 2002 and in 2004 and 2005 - and on two occasions even took the first three places. Le Mans is without doubt the toughest challenge to the Audi Sport Team's engineers because it calls for a level of engineering going far beyond the need merely to keep all the systems focussed on a short, sharp sprint. Alongside the essential virtues of top performance and optimised driving dynamics, the key requirements in long-distance racing are endurance and reliability, allied with optimum ergonomic design. These are genes which are eminently transferable to a road-going sports car too, and which, allied to its exciting design, make the Audi R8 truly unmistakeable. Even at first glance, the caliber of the car is plain to see. The Audi R8 sits wide and low on the road, the strongly accentuated rear end appearing to flex its muscles like a sprinter ready for the off. The characteristic proportions of the vehicle are dictated by the location of the engine behind the cockpit. This layout is a typical feature of race cars. One of the most striking examples of this design - and as such one of the legitimate antecedents of the Audi R8 - was, and still is, the Auto Union Type C Grand Prix car. 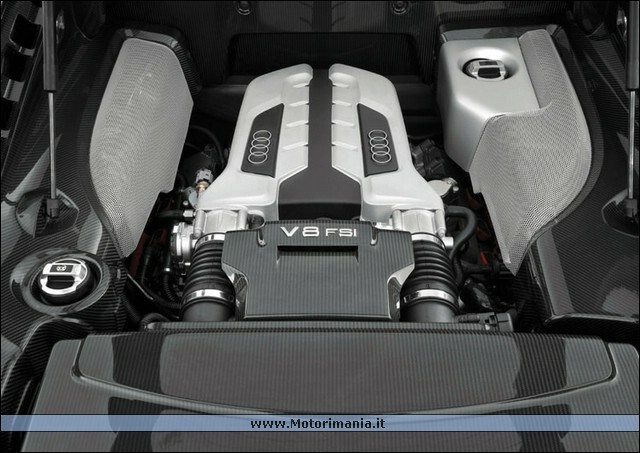 The central position of the engine is above all a boon to driving dynamics, as it allows for a weight distribution, as on the R8, of 44 percent to the front and 56 percent to the rear. The cabin of the Audi R8 is pushed far forward - a typical feature of a mid-engined sports car, and as such a visual cue linking it to the race car of the same name. Behind the cabin, positioned in front of the rear axle, is the V8 FSI engine, a sculptured piece of engineering visible both through the large, shield-shaped rear window and from inside the car. 74.8 inches wide but just 174.4 inches long and 49.2 inches high: these are the proportions of a true sports car. The 104.3-inch wheelbase offers room for the astonishingly spacious cabin and the longitudinally mounted engine behind it. Behind the doors, a large-surface 'sideblade' air deflector sweeps between the wheel arch and the roof section, delivering air for the V8 to breathe as well as for cooling. The paint finish of the sideblades is coordinated with the body color. The front end is characterised by the trapezoidal styling of the Audi single-frame grille, flanked on the right and left by additional large-dimensioned air intakes. For the first time, the four-ring badge is positioned on the hood, above the grille. The flat strips of the innovative LED headlights, with their clear-glass covers, join flush to the tops of the air intakes. The R8 is the first series-production car to offer the option of ordering all the headlight functions - dipped beam, main beam, daytime running lights and indicators - as LEDs. LED stands for 'light-emitting diodes', and represents a technology which offers substantial advantages over conventional bulbs based on a much longer life. Because they take up less space than conventional lights, LEDs provide the designers with greater freedom to be creative. The design of the strikingly three-dimensional main headlights, using LED technology, is particularly eye-catching. Bionics, in other words drawing design inspiration from nature, has been deployed on the R8's headlights. The light unit has a design reminiscent of an open pine cone. Reflector shells arranged concentrically one behind the other, in conjunction with a powerful LED projection system, concentrate the light from one multi-chip LED, producing a high-luminosity, even form of driving light. The internal reflectors of the main beam headlight are styled in a shape inspired by the architecture of the Sydney Opera House. And in contrast to them, the daytime running lights delimit the underside of the headlight as narrow strips of light - delivering distinctive signals and providing an innovative visual touch. It will be possible to order LED headlights as options from the end of 2007 onwards. The interplay of concave and convex lines contours the side-on view of the rear end. Underneath the clearly defined separation edge there is a flat vertical surface framed at its sides by the rear lights - also in LED technology. The third brake light strip runs across virtually the full width of the roof, forming the termination of the transparent engine hood. The latter feature is yet another visual highlight. The observer looks right onto the V8, the very heart of this sports car. Indirect engine compartment lighting by white LEDs, enabling the engine to be seen even in the dark, is available as an option. Two large-format diffuser openings in the rear bumper illustrate how intensively the styling of the Audi R8 is dictated by aerodynamics. The two pairs of circular twin exhaust tailpipes each sit at the right and left above the diffuser openings. 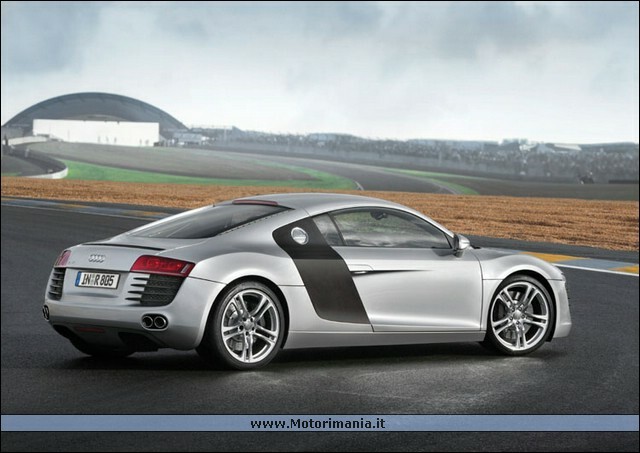 An automatically extending rear spoiler is deployed to assist the R8 in using the wind. It provides additional downforce to boost the suction effect produced by the aerodynamic styling of the underbody and by the diffusers. When travelling at lower speeds, the rear spoiler automatically retracts flush with the body. 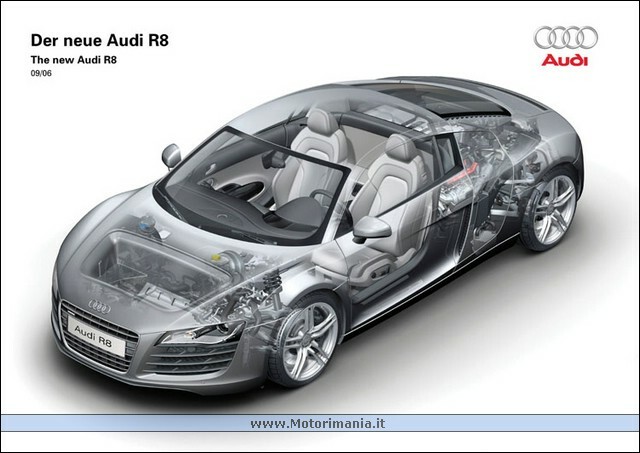 The full aluminum body is constructed in the Audi Space Frame (ASF) design. Its perfect synthesis of minimal weight and maximum rigidity provides the ideal foundation for optimum driving dynamics, as well as delivering an outstanding power-to-weight ratio of just 8.16 lbs./hp. The sporty interior is dominated by a totally driver-oriented cockpit architecture, integrating the driver between the dashboard and the high center console. The instrument panel above the console is angled slightly towards the driver. The flat-bottomed steering wheel is a typical feature of the sportiest Audi models, and also enables comfortable sports car entry and exit. Form follows function: this design principle is implemented throughout the Audi R8. Alongside the driver-oriented architecture, also reflected in the styling of the side window sills, the choice of materials also makes for a highly functional look and feel. Looking around when in the driving seat makes one thing clear: just like in the R8 race car, the styling and placement of all the elements in the cockpit of this driving machine is focussed on the essentials. The centerpoint of everything is the driver. This combination of the aesthetic and the ergonomic is maintained in the colors used and the overall ambience created - dark hues reflect the emphasis on engineering and are again reminiscent of the motorsport world. The impression of professional functionality and ergonomic styling is enhanced by the visible presence of top-quality materials in supreme craftsmanship. The sports seats are trimmed as standard in a Leather/Alcantara combination, or optionally in full leather. Alternatively, the R8 can also be fitted with bucket seats, specially developed by quattro GmbH. There is plenty of room for the two occupants, with comfort levels well beyond the norm of high-performance sports cars. There is space behind the seats to stow large bags, or even two golf bags. The luggage compartment at the front has a capacity of approximately 3.5 cu. ft.
With numerous trim variants and applications in Piano finish or Carbon sigma, there are few limits to the range of customization options for the interior. In the high-revving 420 hp eight-cylinder engine, the evolution of FSI gasoline direct injection technology has reached a new high. 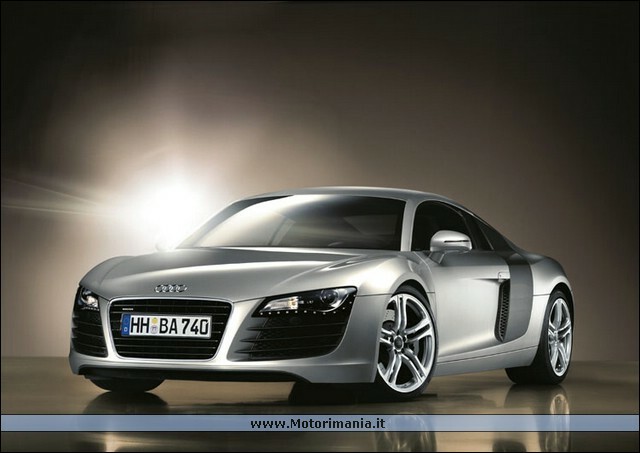 This technology has also enjoyed many triumphs in the Audi R8 race car. 7,800 rpm the 4.2-liter engine delivers 420 hp of power output. Peak torque is 317 ft.-lbs. from 4.500 to 6,000 rpm. And no less than 90 percent of this maximum torque is maintained consistently throughout a wide engine speed range from 3,500 all the way to 7,600 rpm. As a result of these qualities, the eight-cylinder power unit provides maximum thrust in virtually any driving situation. The performance figures are equally impressive: the R8 accelerates from a standstill to 62 mph in 4.6 seconds and reaches a top speed of 185 mph. The engine is a high-revving unit. The maximum engine speed is 8,250 rpm. The advantages of this principle are superior power output at high engine speeds and a smooth, eager responsiveness all across the revs range. Added to this are its agility, liveliness and engine sound, which is similar to that of a race car. The Audi R8's dry sump lubrication - another technology originating directly from motor racing - provides the ideal basis for maximum longitudinal and lateral acceleration. It allows the V8 to be installed lower, thereby lowering the center of gravity and further enhancing driving dynamics. Two transmissions are available: a manual 6-speed gearbox or optionally the Audi R tronic sequential-shift gearbox. Here, too, the influence of the motorsport world is clearly evident, with a joystick gear-shift on the center console and, most especially, the paddles mounted on the steering wheel, which are a long-established ergonomic feature in motorsport. The best illustration of this is once again the Le Mans winning Audi R8, which also enables the driver to change gear on the steering wheel. 'Shift by wire' technology provides for very fast gear-shifting and an outstanding power-to-weight ratio, allied to compact gearbox dimensions. The Sport mode, with its fast shifting, guarantees the absolute maximum in terms of driving fun. An automatic mode can also be selected. Such a powerful Audi is of course fitted with permanent all-wheel drive, which distributes the power variably to the front and rear axles by way of a viscous clutch. 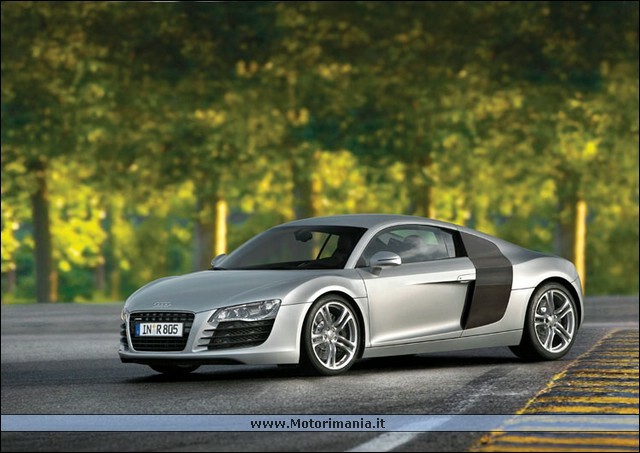 On the Audi R8 the legendary quattro system is adapted to the axle load distribution typical of mid-engined cars. The chassis features forged aluminum double wishbones at the front and rear. At the front they are triangulated, while at the rear the top one is triangulated and the bottom one is a triangulated wishbone with a track rod. This provides for optimum wheel control, and is a geometry which has proved itself to be the ideal solution in delivering agility, maximum steering precision and precisely defined self-steering characteristics. Direct, hydraulic rack-and-pinion steering provides optimum feedback to assist the driver. The spring and damper set-up is stiff in order to deliver maximum driving dynamics, while still providing a quite astonishing level of ride comfort. This is particularly true when the 'Audi magnetic ride' adaptive damper system is chosen as an alternative to the standard gas-filled shock absorbers. The reason for this is that these shock absorbers employ an innovative technology. Instead of the conventional damper fluid, a magnetorheological fluid is used - in other words, a fluid whose viscosity can be influenced by an electromagnetic field. This effect enables the damping characteristic to be influenced electronically at will and instantaneously, by applying a voltage to the electromagnets. Audi magnetic ride uses this property to deliver the correct damping forces in every driving situation, thus optimizing ride comfort and driving dynamics. A computer equipped with sensor technology determines the prevailing driving situation in a matter of milliseconds. Drivers can choose from two driving programs depending on whether they want to drive in a highly sporty style - with the magnetorheological fluid adjusted to a low viscosity - or with the emphasis more on ride comfort. 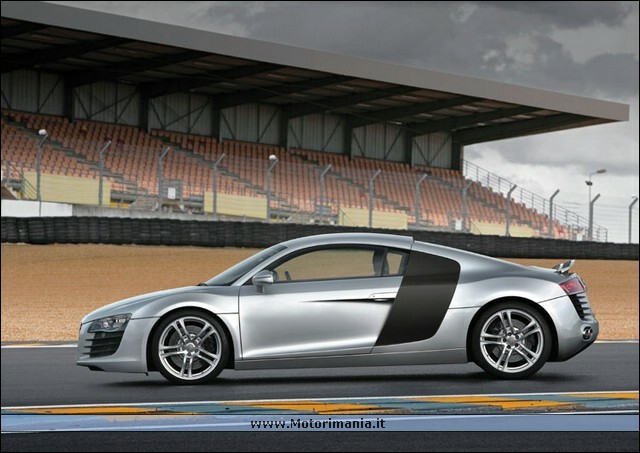 The Audi R8 is fitted with 6-arm 18-inch wheels as standard, and can optionally be ordered with 19-inch wheels. The 235/40 size tires at the front and up to 285/35 at the rear provide the necessary road-holding. This tire configuration also ensures that this mid-engined sports car is always able to translate the dynamism of its drive train and chassis into optimum grip and maximum lateral dynamics. The mid-engined sports car's long wheelbase and extremely low center of gravity ensure that it always retains maximum stability, resulting in superb agility, finely attuned responsiveness to any driver input, and high levels of safety. Even the standard equipment of the Audi R8 meets the high demands of customers in this segment. Xenon plus lights, LED rear lights and daytime running lights, 18-inch aluminum wheels, an audio system with 7-inch monitor, an anti-theft alarm and Leather/Alcantara interior trim are just some of the items on the extensive list of standard features. The acoustic parking system and a rear-view camera help the driver to maneuver into even the tightest of spaces. The radio/navigation system plus, featuring a large-format color monitor and MMI keypad, combines extensive functionality with extreme user-friendliness. A range of coordinated and ideally combinable design and leather trim packages from Audi and from quattro GmbH can turn any R8 into the customer's personal dream car. The wheels range offers design alternatives in sizes of 18 and 19 inches, fitted with 235/35 size tires at the front and up to 295/30 at the rear. A total of eight exterior colors are available, from Ibis White to Phantom Black, pearl effect. The Audi R8 is being built on a small-lot production line in a specially constructed new block at the Audi plant in Neckarsulm. The entire production process - from the bodyshell construction to final assembly - is organized in the same way as a craft workshop. Small teams of specialists accompany every step of production, subjecting every part and component to intense scrutiny. This ensures that every one of the maximum of 15 cars per day built will more than match the customary high quality standards of the Audi product range.